With the end of the year just around the corner, the last thing you want to think about is how to update your home to keep up with the trends for next year. Luckily, there are some interior design trends that will carry into next year. From mixing textiles in your living rooms to embracing sustainable design by supporting local businesses, experts predict that these are some of the interior design trends that will keep your home fashion-forward and ultra chic well into next year. So before you think about redecorating your home, look to see if you’re already incorporating these in your home. That’s right, the sustainable approach to home design is here to stay. Homeowners are upcycling vintage furniture and incorporating pieces that are custom-built with high-quality materials that are crafted to be timeless and sturdy. This goes without saying that hiring local artisans to support their businesses is another step toward going green in the interior design world. Have you noticed that having a bar cart in your home has become one of the key interior design trends on social media in 2017? Having a well-equipped bar cart in your home can act as a centerpiece for your dining room and even your living room. Not only should your bar cart be stocked, it should be upkept and staged for your next cocktail at home. Use your bar cart to store your more attractive martini glasses, bar tools, liquors and mixers, bitters, decanters and decorative vases with fresh flowers to personalize this space. Gone are the days when your loveseat and sofa must be matching. This year, the interior design world has seen the idea of mixing textiles not only to be more trendy, but practical. Do you want to make a statement, but you’re on a budget? Purchase a loveseat in a bold color of your choice, and go simpler on the armchairs in the room. One of the main reasons that mixing textiles has become more popular is because this allows homeowners to buy statement pieces instead of investing in a 5-piece living room set. Exchanging kitchen cabinets for open shelving has been a major interior design trend in homes this year. 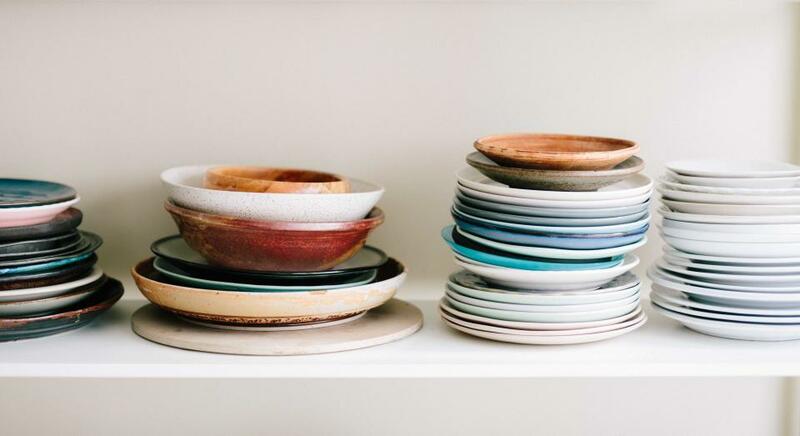 Open shelves allow for you to display your gorgeous matching plates and bowls from West Elm or a family heirloom, for instance. Some homeowners even get more creative with the trend by stacking their favorite cookbooks, pottery or other neat items on their kitchen shelves that would otherwise be hidden behind a cabinet.